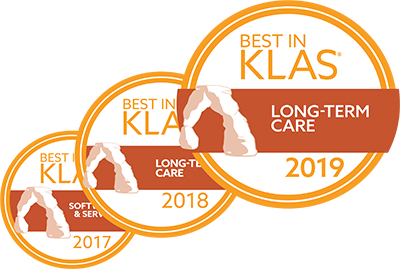 Bloomington, MN – MatrixCare®, the largest long-term, post-acute care (LTPAC) technology provider in the United States and perennial winner of the coveted Best in KLAS award for Long-Term Care Software, has been acknowledged for its interoperability in the recently released report from KLAS Research: Post-Acute Care 2018 – Providers’ simple request: “Help me connect.” Although the report was compiled with limited data* for some sections, KLAS recognized MatrixCare for its strength in receiving and sending data. This recognition reflects MatrixCare’s commitment to interoperability, which was reaffirmed in 2016 in response to the U.S. Department of Health and Human Services (HHS) pledge to make electronic health records work better for residents and providers. The pledge focused on three areas—consumer access, no blocking/transparency, and standards—with the goal of making accurate and timely health information available to individuals, families, and care team members. MatrixCare was the first LTPAC HIT vendor to sign the pledge and remains 100% committed to its principles. As a Federally certified EHR platform delivered on the powerful Microsoft Azure cloud, MatrixCare ensures that the security of provider and patient data are not compromised when the product is used in combination with other technology platforms. MatrixCare facilitates a broad array of both direct provider-to-provider connections and intermediated connections through Health Information Exchanges (HIEs). Under the MatrixCare Connections program launched in 2014, MatrixCare works with independent software vendors to define integration points using MatrixCare’s open API layer and formally certify that the integration operates as expected by the customer in real-world usage. Over 100 third-party systems have been certified to integrate with MatrixCare under the Connections program since inception, and the MatrixCare cloud exchanges information with third-party systems more than 2 million times every day. “Unlike many of our competitors who have well-deserved reputations for being notoriously hard to integrate with, we are 100% focused on supporting open, standards-based interoperability and data access to make it easier for up and downstream referral partners to do business with our customers; thereby increasing their referral business from across the healthcare ecosystem. Our ability to lead the LTPAC industry in interoperability is yet another reason why MatrixCare-powered organizations outperform their peers by a wide, and growing, margin on key outcomes and performance measures across the spectrum of care,” said John Damgaard, MatrixCare CEO. For more information about MatrixCare’s Connections Interoperability Program, visit www.matrixcare.com/connect.